The Ctrl key has ALWAYS been bottom left, and I do mean always. So why would you do this ? 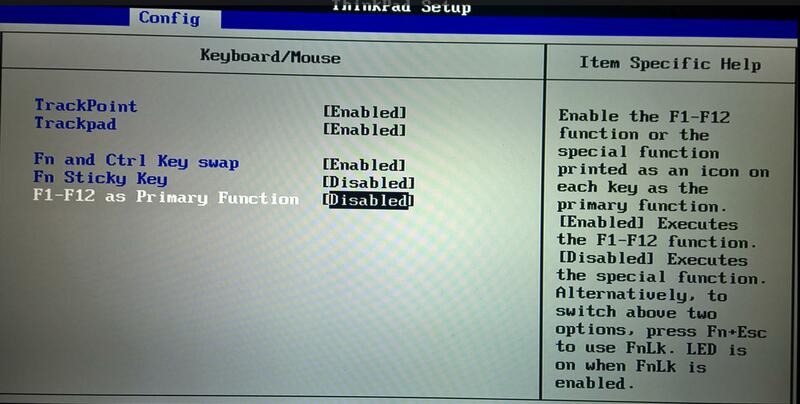 Anyways, seems someone at Lenovo copped enough flack to actually make this configurable. Another one I got from a work colleague last week was ” I wish I could make the function keys be F1 F2 etc by default” as the default is Mute, Volume down etc Well he gets his wish too. And the answer is in the BIOS setup. See here for the basics https://support.lenovo.com/us/en/documents/ht074187 and here is what the screens look like. And here we can set the Fn keys to be F1, F2 etc by default. Having said all that this is a great laptop. It’s got probably one of the best keyboards there is on a laptop, screen as pretty amazing and performance pretty damn good. Next for me is to tweak the touch-pad, it’s way too sensitive by default and I am done.